I am Jennifer Shiman, creator of 30-Second Bunnies Theatre and the other content here at Angry Alien Productions. My passion is developing engaging content viewable across multiple media platforms. Since 2004, I have created and produced over 90 short cartoons with bunnies re-enacting movies in (approximately) 30 seconds. The award-winning shorts have appeared on broadcast tv, on demand, online and in a global ad campaign. 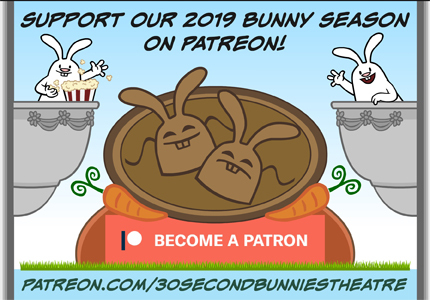 In 2018 I launched a Patreon campaign to help fund six new bunny titles...It was AWESOME! I have some exciting plans for 2019, in progress... Join as a patron to learn details before the April 2019 public launch! I started Angry Alien Productions in 1998 to focus on content development, digital design and production. I enjoy distributing creative work directly to a global audience. Click here for 30-Second Bunnies Theatre in the Media. I got my graduate degree in Media Studies in 1994 from the University of London Institute of Education. from the University Professors Program (Boston University) in 1991. Co-presenter with Scott Dikkers, Animation Workshop. Summer 2011.